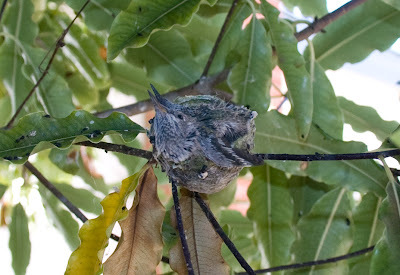 It has been about a week since my last update about the baby hummingbirds. With some patience and very sore feet standing very still, I was able to capture the momma bird feeding the two-week old babies. Today, July 4th, they have grown so big that one of the baby's tiny wings is hanging outside of the nest. While we were watching the baby hummingbirds yesterday, we discovered another baby bird in our backyard. But, this one is not so lucky, it fell out of its nest somewhere and its mother has abandoned it. We waited and waited, but the momma never came back for it. The poor baby was chirping for its momma and for food. 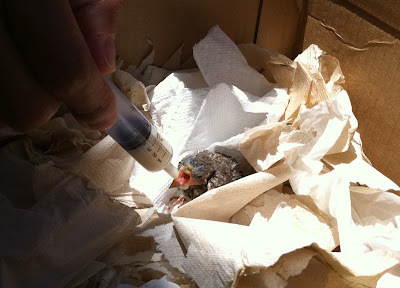 We bought some baby bird food formula and a syringe to feed it. It looks so sad. We had to bring it to the local wildlife rescue because we are going out of town and cannot take care of it. The wildlife rescue worker said lots of people bring lost baby finches to them to raise and then to release into the wild once they can fly and take care of themselves. Great photos. I don't think I've ever seen baby hummingbirds before. What a precious photo. I think it's wonderful too that you took it home to take care of it. I don't know that many would do that. Awww...no why wouldn't the mom come back for her baby? That was good thinking on your part to feed it with baby bird formula. I wouldn't know what to do honestly. Mr. Lonely: Thanks for visiting. Poetic Shutterbug/RoseBelle: My husband's mom used to raise baby cockatiels so we a little experience with raising baby birds. Not sure why the mom didn't come back for her baby. Maybe she already has too many to care for?